With his campaign centered on promoting traditional American values and "draining the swamp" of the political corruption, Donald Trump seemed like a 2nd Amendment and gun rights supporter. All that changed in December of 2018 when the Trump administration signed off on a bump stock ban. The move caused many of his supporters to express their outrage at the ban. Twitter users wrote, "Your little bump stock ban has cost me money and destroyed freedom. You were supposed to help repeal the N.F.A. and not expand it. You were the first and last Republican I'll ever vote for. Never again." Another wrote, "The bump-stock ban is only the beginning. Next, it will be certain mags. Just wait." Related coverage: Trump Administration Approves Bump Stock Ban, Those Who Won't Comply Are Felons! Although the ban was approved and set to take effect in March, that does not mean it will be without its legal challenges. Already, the pro-gun organization Gun Owners of America have filed a lawsuit to challenge the Trump administration directive to ban bump stocks. Most people had never even heard the term bump stock much less knew what one was until they were used in the October 1, 2017, mass shooting in Las Vegas. The GOA filed the lawsuit Wednesday just as they promised they would on December 18. The lawsuit challenges the Trump administration's directive to ban bump stocks and was filed in the Western District of Michigan. The district court is within the jurisdiction of the 6th Court of Appeals. The GOA considers the court to be more friendly to gun ownership and skeptical of government regulations. 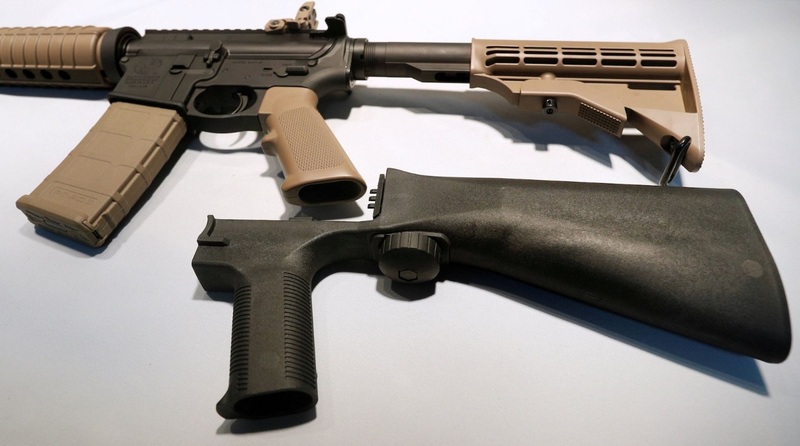 Earlier this month, The Bureau of Alcohol, Tobacco, Firearms, and Explosives (ATF) issued a rule change that classified bump stocks as machine guns, which are illegal. The ATFs reclassification of the bumps stock is ridiculous because they don't turn a gun into a machine gun any more than a well-trained shooter can mimic automatic fire with his trigger finger. Here is a video of a man firing his legal, semi-automatic rifle without a bump stock yet it mimics the same rate of fire as a machine gun. The ban on bump stocks has done little other than to destroy freedoms and take another inch of gun ownership rights. The government has been chipping away at these rights for decades since Democrats ultimately want to take away the citizens' rights to bear arms altogether. Erich Pratt, GOA executive director said, "Our suit will challenge the legality of ATF’s action and ask for an injunction to stop enforcement of the regulations." After the Las Vegas shooting, the media latched on to the fact that some of the shooter's weapons were equipped with the evil bump stocks. This stirred up a national frenzy against bump stocks with the constant coverage that pushed the idea that they turned legal guns into machine guns and there is no reason that a citizen needs a machine gun. Rep. Dina Titus, D-Nev., who has filed a bill to outlaw bump stocks said, "This challenge does not come as a surprise. If the president actually cared about banning bump stocks he would support our legislative efforts to get this done the right way and avoid this legal limbo." The ATF directive would require those in possession of bump stocks who purchased them when they were legal to destroy or turn them into law enforcement. Erich Pratt of GOA added, "If anyone thought the election of Donald Trump would put the Second Amendment community on ‘Easy Street,’ this apparently will not be the case." That video is the true meaning of “gun control”. Controlling your weapon so that it performs the way you want it to. It’s also a lot of fun. What is sad is that they wants to codify to themselves the ability to strip living men and women of their unalienable rights.